Middle Eastern food is having a big moment in the food world. Along with that trend baking with tahini seems to be everywhere. I always have a jar of tahini in my home, it has so many uses from making hummus to salad dressing and sauces. 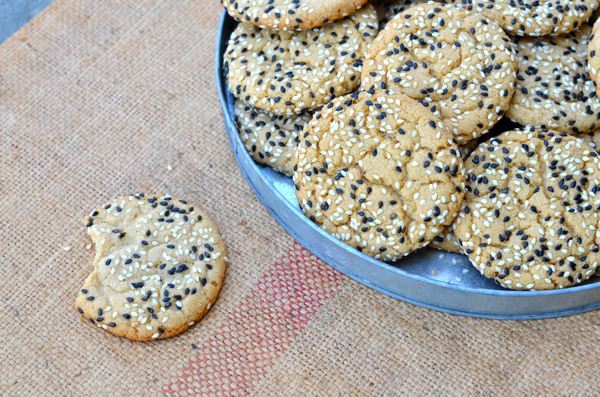 I love the results when I have used tahini in my baking. This cookie has easily become a family favorite. 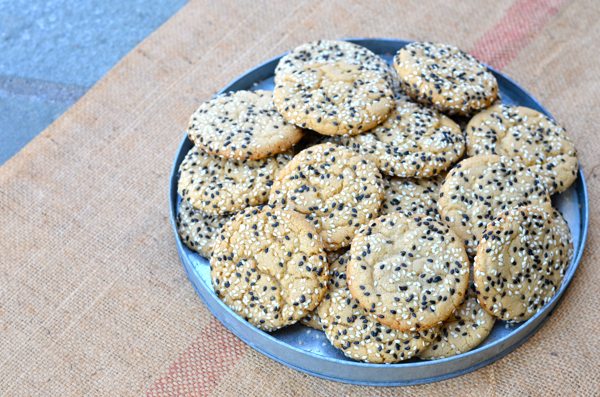 A cookie that is slightly crisp thanks to being rolled in black and white sesame seeds, warm from the cinnamon and a light nutty flavor from the tahini. The cookies last for a week stored in an airtight container. (Although the cookies never last that long). 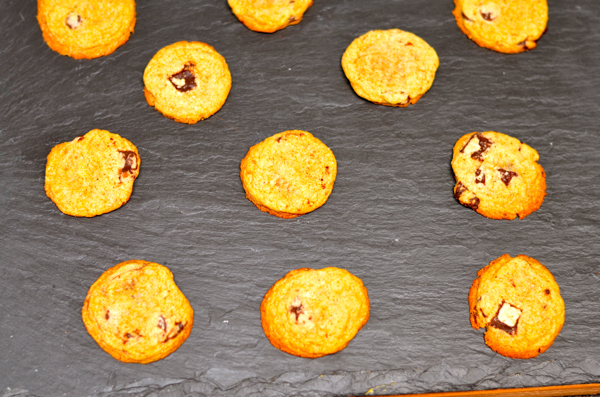 You should definitely give this cookie recipe a try! From by the bay, wishing you great tahini food memories! Preheat the oven to 350 degrees. Line four baking sheets with parchment. In a medium bowl, whisk together flour, baking soda, cinnamon and salt; set aside. In the bowl of an electric mixer fitted with the paddle attachment, beat together butter, sugar, egg, and vanilla on medium-high speed until light and fluffy, about 2 minutes. Beat in tahini. Reduce speed to low; beat in flour mixture until just combined. Cover and refrigerate until firm, about 30 minutes. 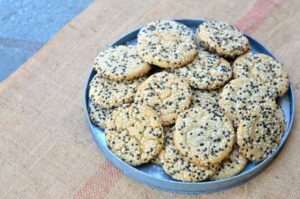 This entry was posted in cookies, desserts and tagged baking, black sesame seeds, cinnamon recipes, cinnamon tahini cookies, middle eastern food, sugar, tahini recipes, vanilla, white sesame seeds on May 1, 2018 by entertainingbythebay. 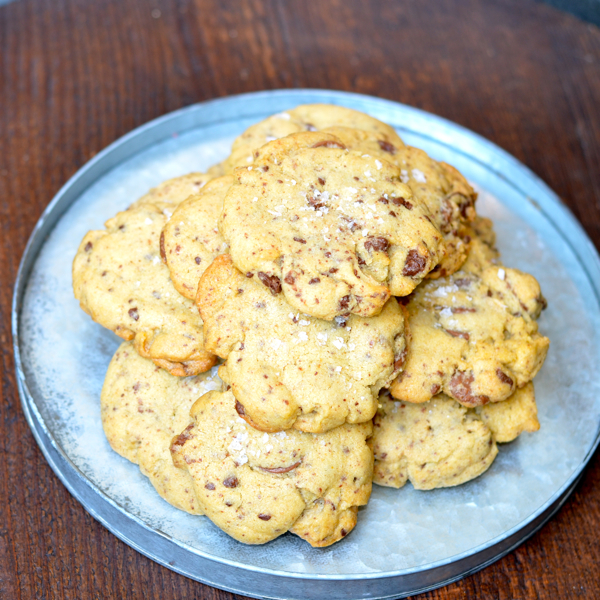 I’m sure most people will say who needs another chocolate chip cookie recipe, but when the source of that recipe is Dorie Greenspan, the ultimate baker of cookies, well one most stop , bake, taste and enjoy. 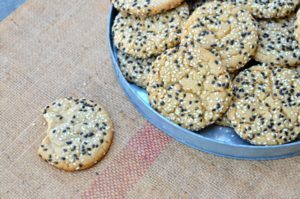 This recipe is a slightly more adult version of the classic cookie adding spices you might not think of adding to the cookie- ground coriander and nutmeg. Before dismissing this, please reconsider…. these spices enhance the flavor, but the flavor is indeed subtle and delicious. I like the idea of adding some spice to chocolate chip cookies and plan to experiment myself with cinnamon and chinese-five spice powder. These cookies have a nice chewy texture, more so than a classic chocolate chip. This is definitely a great alternative and also seems to appeal to those who may not normally like a chocolate chip cookie. I highly recommend Dorie’s cookbook, “Dorie’s Cookies” published in 2016. It’s a great cookie bible from one of the greatest baker of our time. I use this book over and over again. 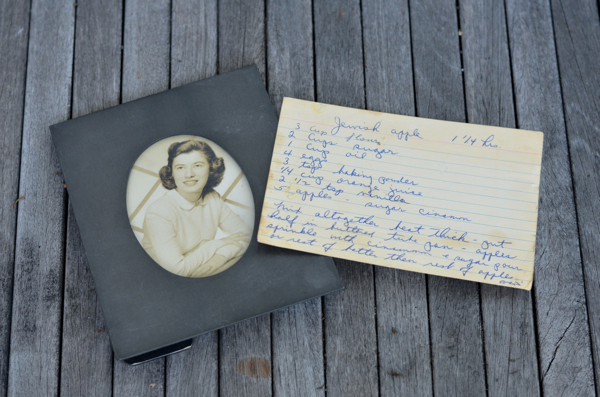 I especially enjoy how Dorie suggests variations and changes to her recipes to try for fun. If you can’t have fun baking and eating cookies, well when can you have fun? From by the bay, wishing you fun chocolate chip cookie food memories! Center a rack in the oven and preheat the oven to 375 degrees F. Line two baking sheets with parchment or silicone mats. Whisk together the flour, salt, and baking soda. Working with a stand mixer, preferably fitted with the paddle attachment, or with a hand mixer in a large bowl, beat the butter at medium speed for about 1 minute, until smooth. Add the sugars and beat for another 2 minutes or so, until well-blended. Beat in the vanilla. Add the eggs one at a time, beating for 1 minute after each egg goes inches Reduce the mixer speed to low and add the dry ingredients in 3 portions, mixing only until each addition is incorporated. On low speed, or by hand with a rubber spatula, mix in the chocolate and nuts. Spoon the dough by slightly rounded tablespoonfuls onto the baking sheets, leaving about 2 inches between spoonfuls. Bake the cookies- one sheet at a time and rotating the sheet at the midway point- for 10-12 minutes, or until they are brown at the edges and golden in the center; they may still be a little soft in the middle, and that’s just fine. Pull the sheet from the oven and allow the cookies to rest for 1 minute, then carefully, using a wide metal spatula, transfer them to racks to cool to room temperature.Repeat with the remainder of the dough, cooling the baking sheets between batches. Repeat with the remaining dough, being certain to use cool baking sheets. This entry was posted in cookies, desserts and tagged baking, best chocolate chip cookie, brown sugar recipes, chocolate chip cookies, coriander, Dorie Greenspan, nutmeg, sea salt, vanilla, whole wheat on March 8, 2018 by entertainingbythebay. Many years ago when I was just starting my career in fashion, I took my first of many trips to London. It was on that first trip I discovered the culture of high tea and scones. I also vividly remember my embarrassment when I ordered scones for breakfast , only to be told that they are only served in the afternoon at high tea. Well, it’s many years later and well we live in a culture where we can have any food we want any time of day or night. So with that I do like the luxury of a nice scone on a quiet, leisurely weekend morning. This is my favorite go to scone recipe. This recipe has evolved over the years and my latest twist is soaking the currants or raisins in Earl Gary Tea enhancing subtly the sweetness of the currants. 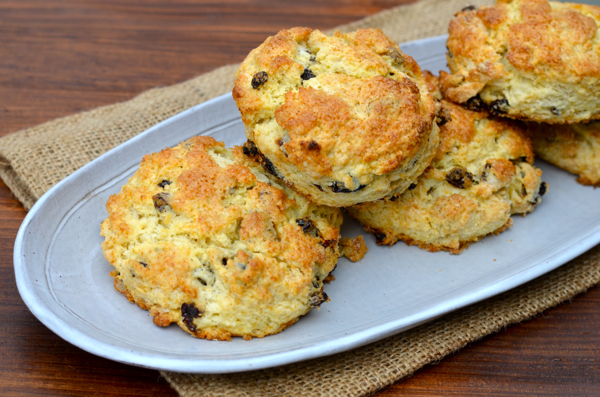 You’ll be surprised how easy this recipe to prepare scones this delicious. From by the bay wishing you high tea anytime food memories! a blend of India and Sri Lankan black teas which are flavored with the oil of bergamot. 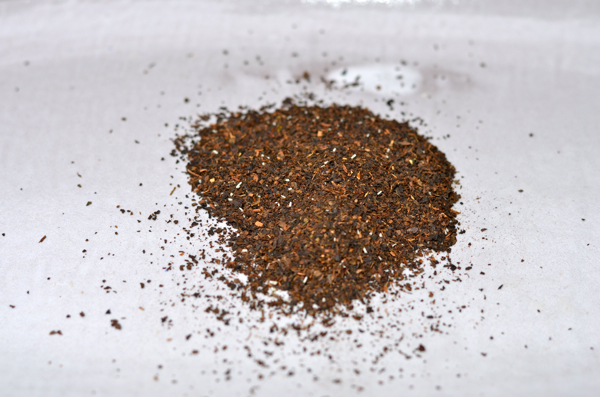 This tea is named after the mid- 19th century British Prime Minister Earl Charles Grey. Earl Grey Tea has several health benefits. As many traditional teas, Earl Grey tea leaves come from the tea plant — Camellia sinensis — and contain compounds called flavonoids and flavanols which are natural chemicals. These tea components are potent antioxidants which with regular use may help with protection from digestive cancer and cardiovascular disease. In a small bowl add currants and teabag. Cover with boiling water and set aside for 15 minutes. Remove teabag and strain the currants. Set currants aside. Preheat oven to 400 degrees F. Sift flour and baking powder into a large mixing bowl. Add sugar and salt and whisk together. Add butter and blend with fingertips until mixture resembles a coarse meal. Mix in currants. Whisk cream and eggs in a small bowl and add to the flour mixture. Stir until just combined do not overwork. Transfer dough to a lightly floured work surface and pat to 1 inch round. Cut out rounds using 3 inch cookie cutter. Gather dough to cut additional rounds. Transfer scones to a parchment lined baking sheet. Brush dough with cream and sprinkle with demerara sugar. Bake scones for 10 minutes. Reduce oven temperature to 350 degrees F and continue baking until golden brown approximately 15 to 20 minutes. Cool slightly and serve warm or at room temperature. Scones are best eaten same day. This entry was posted in breakfast, pastry and tagged baking, cream recipes, currants, Earl Grey Soaked Currant Cream Scones, Earl Grey Tea, high tea, London, raisins, scone recipes, Tea recipes, United Kingdom on January 26, 2017 by entertainingbythebay. One of the many things I love about cooking is that inspiration can come from the most unlikely places. My inspiration for this recipe came from my health club. Yes, you heard that right, my trainer had just returned from a trip to Rome and brought back with her bags of the most amazing chocolate chip biscotti. These crispy little biscuits were so delicious, I was charged with creating a version as close to the original as possible. 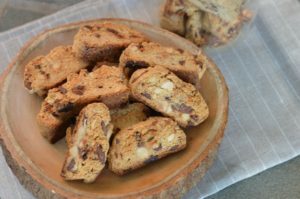 I’m sharing my version of chocolate chip biscotti, here are a few tips : italians typically use their “00” flour for baking. This flour is low gluten and very fine, used in Italy for making pasta and sweets. If you can’t find type “00” flour use pastry flour or all purpose flour. It will have a slightly different texture. It’s very important to use a high quality chocolate. I like chopping my own chocolate . These biscotti are crispy and not too sweet. You will be transported to Italy with each bite. This is a cookie you will always want on hand. 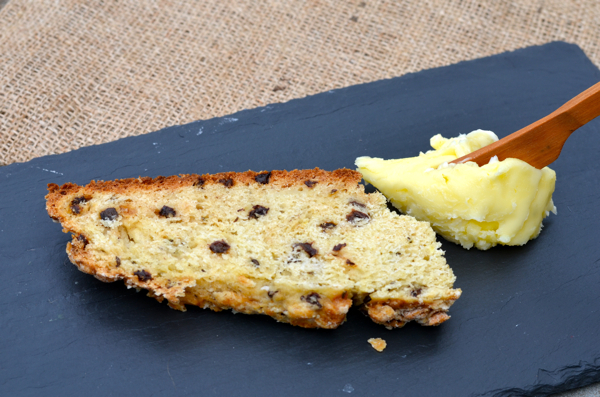 From by the bay, wishing you crispy biscotti memories! Heat oven to 350° F. Place almonds on a baking sheet and toasted in the oven for approximately 8 minutes as they start to turn golden brown. Remove from oven and cool. Coarsely cut and set aside. In a bowl, combine flour, salt, and baking powder. Place aside. In a stand mixer, oil and 3/4 cup sugar together. Add the eggs and continue to mix. Add sambuca, and vanilla. Add flour until combined. Add toasted almonds and chocolate. Mix to combine. Cut the dough in half and roll into two logs, each approximately 2 inches wide and 12 inches long. Place logs side by side 3 inches apart on a parchment lined baking sheet. Sprinkle the top of the logs with extra sugar. Bake on center rack for 30-40 minutes, or until golden brown. Take the logs out of the oven and cool for 10 minutes. Use a serrated knife and cut into 3/4 inch slices. Place cookies on baking sheet cut side up in oven and bake for 10 minutes on each side until golden brown. Remove from oven and cool. Store in an air tight container for 1 week. This entry was posted in cookies, desserts and tagged baking, chocolate chip biscotti, chocolate recipes, dark chocolate, fall recipes, italian food, italian recipes, sambuca on October 13, 2016 by entertainingbythebay. For as long as I can remember, my Mom made this apple cake. At this stage of my life, this means it’s a very long time, let’s just say Mom is over 90 and we can leave it at that! 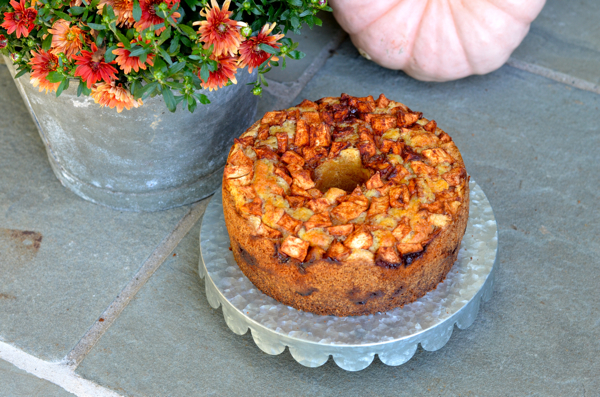 When Mom referred to this cake she called it Mom’s cake -meaning my dad’s mom or my mom called it the Jewish Apple Cake. Now for starters we are not Jewish. 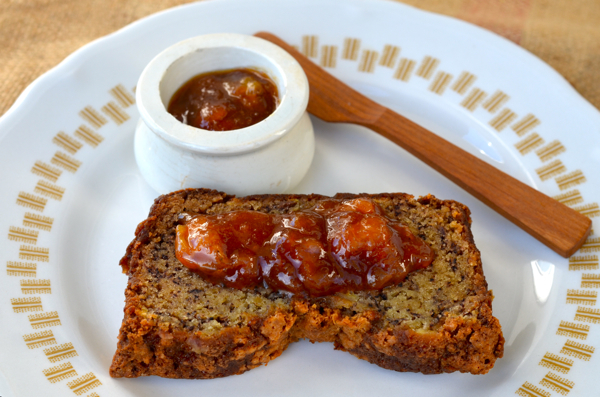 We also called several cake’s mom’s cake since my grandmother was an amazing baker – thus the need to further identify the cake such as Jewish Apple. I did a little on line search about Jewish Apple Cake. It seems it’s called Jewish Apple because it does not use dairy such as milk or butter. There are many versions of this recipe with slight variations but basically the same recipe. I also read that this recipe was published long ago in some women’s magazine. No matter the source, the real testament to this recipe is that it’s so good, it had stood the test of time . A recipe passed by word of mouth from generation to generation and from friend to friend. The bottom line about this cake how good it tastes, that it is super easy to make and it’s a true celebration of fall! It’s a cake that satisfies the apple lover in each of us. You will get such joy from the wafting aroma of baking apples, sugar and cinnamon and then the joy of eating this yummy cake. From by the bay, wishing you tasty apple cake food memories! Preheat oven to 350 degrees F. Use nonstick cooking spray to grease tall tube pan, then lightly dust with flour. Peel and core the apples, then cut into 1 inch cubes. Place in a bowl and sprinkle with the 5 tablespoons of sugar and cinnamon. Toss to coat the apples evenly. Set aside. In another bowl sift together the flour and baking powder. In a separate bowl add the oil, juice, sugar, vanilla and eggs. Mix well. Add the wet ingredients into the dry and mix well. the batter will be thick. Pour half the batter into the tube pan, make sure the batter is spread evenly. Top with half the apples. Pour the remaining batter into the tube, again ensuring the batter is spread. Arrange remaining apples over the top. Bake for 1 1/2 hours or until a tester comes out clean. Let cool completely ( at least 25 minutes). Run a clean knife between the cake and pan to loosen the cake before turning onto a plate. 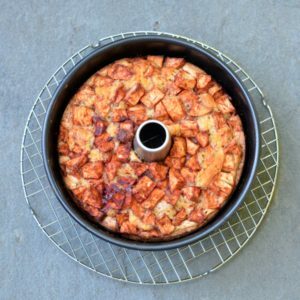 This entry was posted in cakes, desserts and tagged apple recipes, baking, cinnamon recipes, cinnamon sugar, fall recipes, fruit recipes, German Apple Cake, Jewish Apple Cake on September 29, 2016 by entertainingbythebay. It’s Fall and time to get back into the kitchen to bake. I can’t think of a better cookie than this bumped up version of a chocolate chip cookie. This is by far my favorite recipe. It’s crispy, sweet and salty. Chocolate is in every bite thanks to using different sizes of chocolate bits in the cookie. You will want to make this recipe over and over again. From by the bay wishing you sweet chocolate food memories! Find chocolate wafers (do not use chocolate wafer cookies) at specialty food stores, some grocery stores, and online. Pulse ¾ cup chocolate wafers in a food processor until pea-sized pieces form. Whisk all-purpose flour, rye flour, baking soda, and kosher salt in a medium bowl. Using an electric mixer on medium speed, beat butter, brown sugar, and granulated sugar in a large bowl, scraping down sides of bowl as needed, until light and fluffy, 3–4 minutes. Add egg, vanilla, and bourbon and beat until fully incorporated, about 1 minute. Reduce speed to low and slowly add dry ingredients, mixing just to blend. Fold in chopped chocolate and remaining chocolate wafers. Portion dough into 16 balls (about ¼ cup each) and transfer to a rimmed sheet sheet as you go. Wrap tightly with plastic wrap and chill at least 3 hours or up to 1 day. Position rack in middle of oven and preheat to 350°. 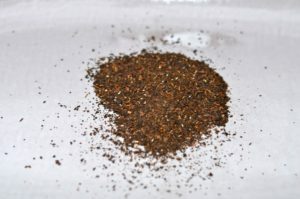 Scrape vanilla seeds into sea salt in a small bowl and mix to combine (save pod for another use). Divide dough balls between 2 parchment-lined baking sheets, spacing 3″ apart. Flatten each ball to about ¾” thick and sprinkle with vanilla salt. Bake cookies, rotating sheets halfway through, until golden brown around the edges, 14–18 minutes (cookies will firm up as they cool). Let cool slightly on baking sheets, then transfer to wire racks and let cool completely. Do Ahead: Cookies can be made 1 day ahead. Store airtight at room temperature. This entry was posted in cookies, desserts and tagged baking, best chocolate chip cookie, Bourbon recipes, chocolate chip recipes, Maldon salt, rye recipes, whiskey and rye chocolate chip cookies, whiskey recipes on September 22, 2016 by entertainingbythebay. 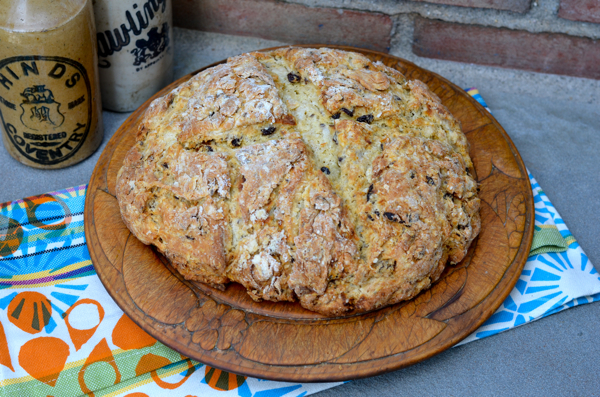 Although I’m not Irish, I have always enjoyed eating Irish Soda Bread. 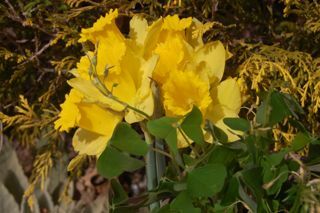 St. Patrick’s Day is the unofficial start of Spring. After a long winter, you start to see the signs of spring. The crocus start peeking out of the ground, there is a big outdoor parade with lots of green the official color of spring and then there is Irish Soda Bread. I had some Irish good luck when my mother’s close friend Nancy, shared her family recipe with me. I find this bread pretty easy to make and quite forgiving in the preparation. Ready to celebrate Spring with some of your own good luck? From by the bay wishing you some good luck food memories of your own! Preheat the oven to 350 degrees F. Line a sheet pan with parchment paper. Combine the flour, sugar, baking soda, baking powder, caraway seeds and salt in the bowl of an electric mixer fitted with the paddle attachment. Add the butter and mix on low speed until the butter is mixed into the flour. With a fork, lightly beat the buttermilk and egg together in a measuring cup. With the mixer on low speed, slowly add the buttermilk mixture to the flour mixture. Combine the currants with 1 tablespoon of flour and mix into the dough. It will be very wet. Dump the dough onto a well-floured board and knead it a few times into a round loaf. Place the loaf on the prepared sheet pan and lightly cut an X into the top of the bread with a serrated knife. Bake for 45 to 55 minutes, or until a cake tester comes out clean. When you tap the loaf, it will have a hollow sound. Cool on a baking rack. Serve warm or at room temperature. 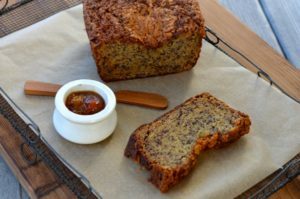 This entry was posted in Bread and tagged baking, caraway recipes, currant recipes, irish soda bread recipe, spring food, spring recipes, St. Patrick's Day on March 16, 2016 by entertainingbythebay. 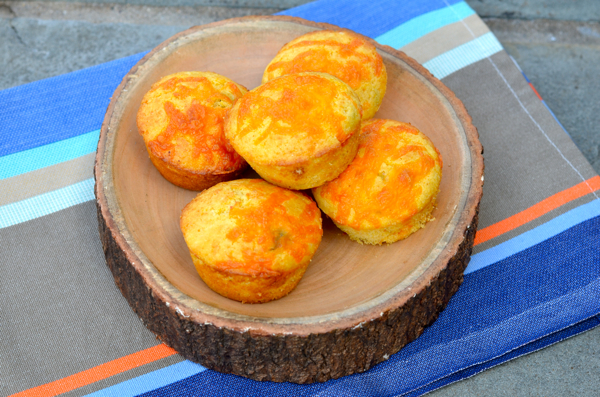 My personal preference for breakfast is savory over sweet, so that is how I came up with this savory corn muffin recipe. This recipe is perfect for breakfast or to serve at dinner whenever you would normally use corn bread such as along side chili or your favorite meatloaf. To make this even better, the recipe couldn’t be easier, it’s just measure some ingredients, mix and bake! From by the bay, wishing you savory food memories! Preheat oven to 400 degrees F (200 degrees C). Grease muffin pan or line with paper muffin liners. In a large bowl, mix together corn meal, flour, sugar, baking powder and salt. Add egg, butter,buttermilk scallions and 1/4 cup cheddar cheese. Stir gently to combine. Spoon batter into prepared muffin cups. Top each muffin with remaining cheddar cheese. Bake at 400 degrees F (200 degrees C) for 15 to 20 minutes, or until a tester inserted into a muffin comes out clean. Cool for 10 minutes and remove from pan. Serve warm or at room temperature. This entry was posted in breakfast, muffins and tagged baking, cheddar cheese recipes, corn bread recipes, cornmeal, savory corn muffins, scallion recipes on January 6, 2016 by entertainingbythebay. 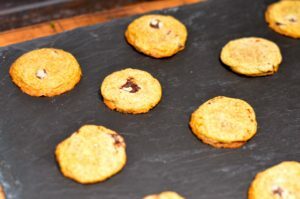 This is a delicious cookie – crispy on the outside, softer on the inside with a double dose of chocolate using good quality cocoa powder and chocolate chips and then two surprise ingredients. The first twist is using rice krispies which gives the cookie a light crunchy texture and then I top the cookie with coarse sea salt. I love to use Maldon sea salt. 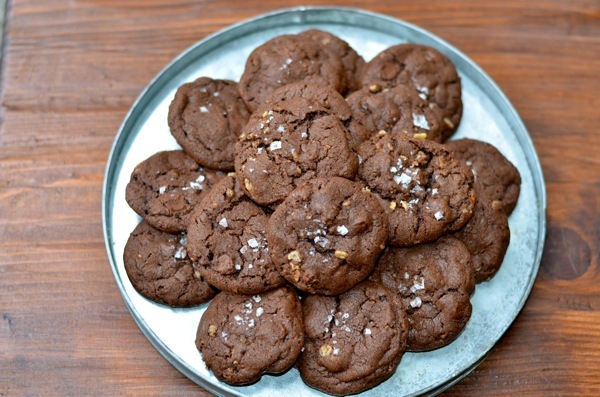 It gives a lovely subtle salty balance to the double chocolate sweetness. This sweet and salty cookie is definitely a wow! From by the bay, wishing you sweet and salty chocolate food memories! Place racks in the center and upper third of the oven and preheat oven to 350 degrees F. Line two baking sheets with parchment paper and set aside. In the bowl of an electric stand mixer fitted with a paddle attachment, cream together butter and sugar until light and fluffy, about 3 to 5 minutes. Scrape down the sides of the bowl and add the egg and vanilla extract. Beat for 1 minute more. In a medium bowl shiftt together flour, cocoa powder, baking powder, baking soda, and salt. Add the dry ingredients all at once to the butter and egg mixture. Beat on low speed until just combined. Stop the mixer and stir in the chocolate chips and rice krispies. Roll dough by the heaping tablespoonful. Place on cookie sheet, leaving about 2-inches between each dough ball. Bake for 12 to 15 minutes or until cookies are just done. the cookie will set while cooling. Allow to rest on the baking sheet for 5 minutes before removing to a wire rack to cool before storing. Eat within the week. This entry was posted in cookies, desserts and tagged baking, chocolate cookie recipes, chocolate recipes, double chocolate rice krispies cookies, Halloween recipes, Maldon sea salt, rice krispies, sea salt, sweet and salty, sweet treats on October 28, 2015 by entertainingbythebay.